After the mysterious brutal death of an old friend, a group of teenagers find themselves in possession of Stay Alive, a next generation horror survival videogame based on the spine-chilling true story of a 17th century noblewoman known as "The Blood Countess". The gamers don't know anything about the game other than they are not suppposed to have it...and they are dying to play it. Not able to resist temptation, the group begin to play the grisly game and soon a chilling connection is made - they are each being murdered one-by-one in the same method as the character they played in the game. As the line between the game world and the real world disappears, the group must find a way to defeat the vicious and merciless Blood Countess - all the while trying to Stay Alive. This reviewer shall continue to whine about how filmmakers are wasting precious resources by churning out horror flicks like this – right up to the day when these movies cease to exist. Yes, just as much as we are sure that you are chuckling at this silly notion, we also know that is almost impossible. We also realize that pictures of such genre bring in the money, because of the possible cheap scares it brings. Strange fetish the movie crowd nowadays has, we’d say. This slash-happy movie tells the ever-predictable story of a group of teens who lay their hands on a video game which bears an uncreative title “Stay Alive”. The objective of the game? To stay alive, of course. If not, players would die a horrible death once they die in the game, as the players would gradually find out. While we have often asked ourselves what we would do if faced with the same dire situation, we have always thought that we would be smarter than those stereotypical characters – anytime. But what is new? Watching a movie like this, you’d know how they would die one by one, and thankfully, this William Brent Bell-directed flick only puts us through 86 minutes of such mind-numbing exercise. To be fair, the idea behind the movie is a creative one. But 10 minutes into the noisy movie, it becomes a typical fright fest with the obligatory bag of cheap scares which include mindless screaming and running. Probably because of its family-friendly rating, the scares do not go beyond a brief wide shot of a bloody corpse. Gamers would enjoy the engagingly-executed video game sequences. Wait, they would go play an actual game if they wanted thrills in that form. The bland acting from the TV actors does not help to make the viewing experience any more interesting. With Frankie “Malcom in the Middle” Muniz as its most recognizable face, we’d be damned if we commended any of the cast member’s ability to emote. While we morbidly look forward to bashing a movie like this, we also understand that there must actually be an equally morbid crowd out there who enjoys movies of this genre. That is possibly the only reason why studios are churning them out one by one. This Code 3 disc contains zero special features. 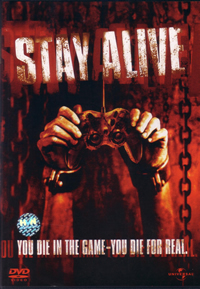 It’d have been nice to include a trial version of the actual “Stay Alive” video game just for kicks. But then again, this might have been a more superior feature than the movie itself. If you were really bored, you’d switch language options between English, Japanese and Thai. The polished look of this Hollywood production (another redeeming factor of this movie!) is maintained with the disc’s nice visual transfer.